Ben Mendelewicz is a visual artist and musician working in New York City. The southern-gothic style seen in his print work unsettles and then mesmerizes viewers. When I first searched through Mendelewicz’s catalogue I found the work intimidating. There is not a lot of plain information in the storylines, but a whole lot of psychedelic sharp turns that have your eyes rushing forward. As I dug more, I began to soak up his dream-logic atmosphere and bawdy characterizations. Everything in his world seems to be slightly electrocuted and a little raunchy. 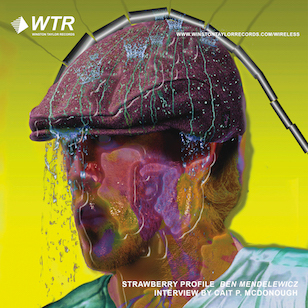 Mendelewicz is part of Macula Dog, a collaboration with bandmate Matt Cutler. The band is unique in style and surprise as well. Mendelewicz and Cutler (who are brothers, cousins, or neither depending on the moment) are known to use mannequins and odd costumes in performances. The bizarre prop show adds dimension to an already experimental sound. It is not clear if the theatrics are for their own fun as a duo or for the audience’s experience. I was able to talk to Mendelewicz about his artwork and music here in our July interview. We met on a roof in Lower Manhattan and enjoyed a breezy afternoon -- which you’ll hear a little bit of in the recording. We spoke a lot about humor versus horror in respect to the way his work is received. I most enjoyed hearing about Ben’s technique in manipulating images, his plans for more soap opera comics and his solo music ambitions. Ben elaborates on the fantastic mix he put together for the show. The playlist features ZZ Top, Maxine Brown, Charles Dodge and other murky good ones.